It seems that this week is “pasta week” – as we have 3 new recipes to share with you! Monday, we shared the Sausage & Ziti Bake and on Friday we have a new Instant Pot pasta recipe for you! 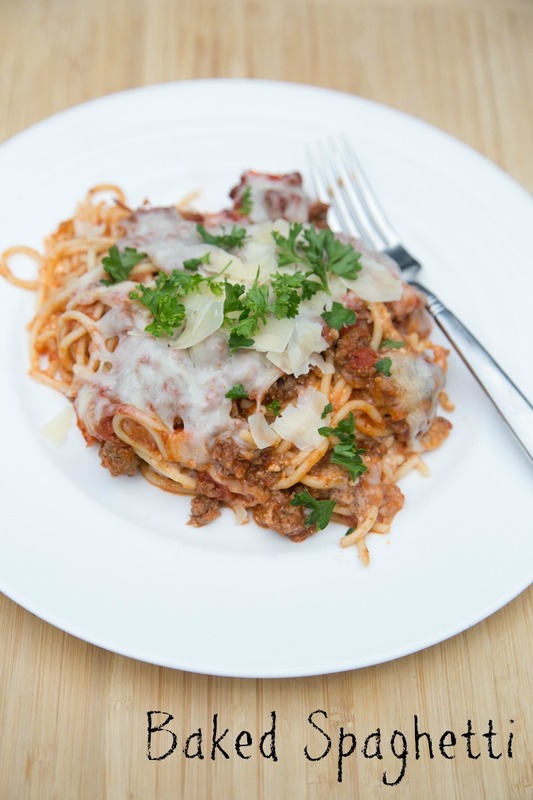 This is a traditional Baked Spaghetti that is freezer friendly and one of our new MyFreezEasy meals! While most of our MyFreezEasy meals don’t require much pre-cooking, this one does…and it’s so worth it! Cook the pasta, brown the ground beef, mix up the egg and cheese, and then layer it all together with the other ingredients and freeze before baking. Then, let it quick thaw and then bake it to perfection! And my boys love to take this in a little Thermos in their lunchboxes too! Preheat the oven to 350 F. Lightly grease a 9×13-inch baking dish with non-stick cooking spray. Cook the pasta noodles to al dente. Drain well. In a large skillet, brown the ground beef with the chopped red bell pepper, minced onion and garlic powder. Once browned, drain and then mix in the jars of marinara sauce. In a large mixing bowl, mix together the sour cream, egg and grated Parmesan cheese. To the prepared baking dish, layer in the cooked pasta, sour cream-cheese mixture, beef sauce and then top with the shredded mozzarella cheese. Cover with foil and bake in the preheated oven for 30 minutes, and then uncover and bake for another 15 to 10 minutes, or until cheese begins to golden. Serve Baked Spaghetti with side salad. This recipe is featured on SouthernPlate.com’s Meal Plan Monday #86.